Prepare three 9-inch cake pans with shortening and flour. Line the bottom with parchment paper. Put the cake mixes, vanilla yogurt, chocolate milk, eggs, and oil in mixing bowl. Mix for 30 seconds on low and then beat for 2 minutes on medium. Divide the batter between three prepared 9-inch cake pans (about 3 1/3 cups of batter in each pan). Bake at 325 degrees for 35-40 minutes. Cool the cakes in the pans on a rack for 30 minutes. Remove from the pans and cool completely on the rack. When ready to assemble, cut the domed tops off the cakes. Spread a little buttercream on the cake stand and add one cake. Top with 2 cups of buttercream. Use an offset spatula to spread out the buttercream. Top with the second and third layers and more buttercream. Run an offset spatula around the cake to make the frosting between the layers level with the cakes, allowing some of the chocolate cake to show through. Put the cake in the fridge for about 30 minutes to chill. Remove the cake from the fridge and pour the ganache on top of the cake, spreading it out and allowing some of the chocolate to drizzle down the sides. Return the cake to the fridge. 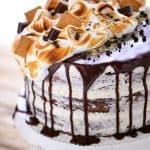 When the meringue is complete, remove the cake from the fridge and spoon the meringue on half of the cake, making swirls and peaks for texture. Use a kitchen torch to toast the meringue. Garnish the top of the cake with graham crackers, Hershey’s bars, mini chocolate chips, and chocolate sprinkles. Bring the heavy cream to a boil. Add the chocolate and let it sit for three minutes. Stir until smooth. Allow the chocolate to cool until slightly thickened but still pourable. Beat together butter and shortening until smooth. Beat in the marshmallow cream. Mix in the powdered sugar, one cup at a time. Beat in the vanilla and milk until fluffy. Stir in the graham cracker crumbs. Bring a small amount of water to a boil in a pot on the stove top. Whisk the egg whites and sugar in the metal bowl of a stand mixer. Place the bowl of the pot of boiling water (do not allow the bowl to touch the water) and whisk continuously until the sugar has melted and the mixture reaches 140 degrees. Move the bowl to the stand mixer and beat with the whisk attachment until the meringue is thick and glossy and stiff peaks form.